After more than 20 years in the Atlanta area, Corgan is proud to announce the opening of our Atlanta office and to welcome Corgan's new Office Director, Interiors Studio Principal and Atlanta native, Joyce Fownes, to the team. Joyce Fownes is charged with stewarding our existing relationships, staffing, business development and establishing the firm in the Atlanta market. “We’re excited to have Joyce spearheading the effort. She brings with her 38 years of experience designing corporate headquarters, legal and broadcast facilities, and adaptive-reuse projects—strongly aligned with our sector’s core verticals, deeply rooted insights into the Atlanta marketplace, and a proven track record of building teams from the ground up,” said Lindsay Wilson, Executive Managing Principal. Most recently as the Corporate Interiors Practice Leader and Southeast Regional Practice Leader at Perkins+Will, Fownes has been instrumental in creating an organizational culture that incorporates cutting-edge design with the client’s goals at the heart of each project. She believes “everything starts with the client, and that responsible, quality design needs to authentically respond to their needs to produce innovative, brand-centric solutions.” Fownes, a graduate of the University of Georgia has been involved in 14 million square feet of interior design work and is on the board of the American Society of Interior Designers, a member of Allied IIDA, CoreNet Global, NAIOP, and LEED AP BD+C. With more than 1 million square feet of data center space in the area, active aviation work, including an on-call contract with ATL and the recent completion of Mannington’s new Customer Experience Center, we have our sights on expanding Corgan's portfolio and introducing our education practice to respond to Atlanta’s rapidly growing population. 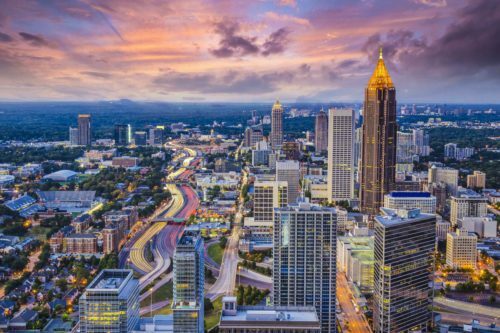 “Atlanta’s diverse economy makes it an attractive place to be for a firm like ours with such a diverse design practice,” shared Bob Morris, President and CEO. The growth into Atlanta is a deliberate but natural progression for our firm. “In a market primed for accelerated growth, we believe Corgan is well-positioned with established relationships, growing demand, and strong synergies between our portfolio of current work and the opportunities prevalent in Atlanta.” The new office, located at 400 Colony Square in Midtown, will allow Corgan to locally serve our existing Atlanta clients including Delta, CyrusOne, T5 and Mannington Commercial. “We have enjoyed a great relationship with Corgan for both product design as well as the interior design of our new Design Center in Atlanta. We are thrilled to welcome them to Atlanta,” said Jack Ganley, President of Mannington Commercial.